SmallJoes.com – APEX Display Case back in stock + Marvel pre-orders! Hi folks! We have some pre-orders and restocked products to tell you about. Take a look and thank you for your interest. After a long wait, we are pleased to announce the return of the APEX Action Figure Display Case. The case includes three parts: a crystal clear poly-styrene base, a stand, and cover. The cover fits snugly around the base to keep out unwanted dust. 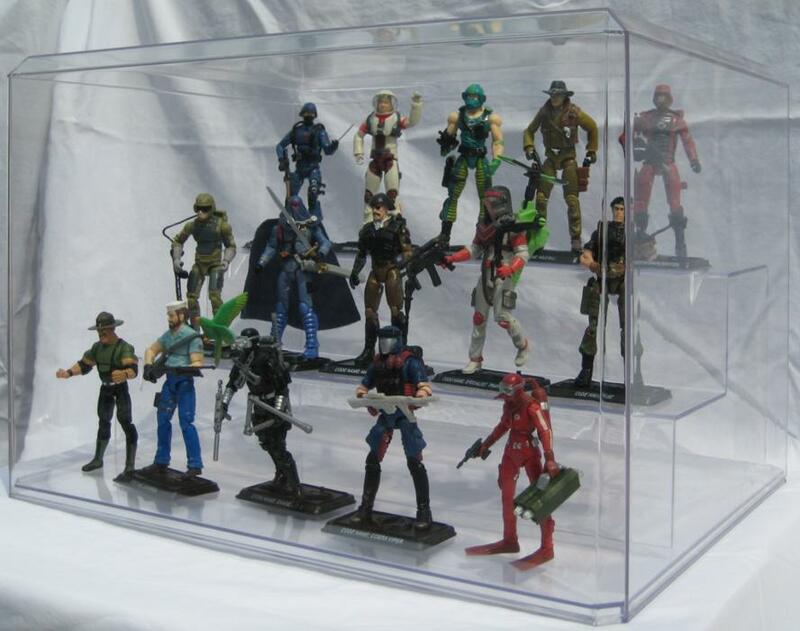 The stand is designed to fit neatly inside of the case and to maximize space for display of 3 3/4″ – 4″ (roughly 1:18 scale) action figures, or other figurines and collectibles of similar size. Made 100% in the U.S.A. Wave 2 (2015) Marvel Avengers 4″ figures are available fore pre-order. This set of 6 figures is available for $72.99 and includes Thunderstrike, Shanna, Doc Ock, Armored Daredevil, Vulture, and Miles Morales Ultimate Spider-Man. We have in the clearance aisle a lot of cool stuff at low prices. GI JOE Retaliation, Indiana Jones, Marvel 4″ figures, GI JOE t-shirts, Gears of War 3 4″ figures, 1:6 scale figures, and much much more! Click the continue reading link below to see the full Big Bad Toy Store new release newsletter! SmallJoes News – New Marvel Legends, 1:6 scale military, and more! Hi folks! We have some new product arrives to tell you about in the 6″ Marvel Legends and 1:6 scale (12″) military action figure category. Take a look and thank you for your interest. Wave 2 (2015) Marvel Legends 6″ figures have arrived. This set of 6 figures is available for $134.99 and includes Batroc, Hellcat, Captain America, Spider-Woman, Iron Man Mark 43, and Hulk. This assortment features Build-A-Figure Thanos. Lke your GI JOE… and candy? We have three styles of collectible GI JOE tins available. These are new product, factory sealed and contain a bag of jelly beans. Great for storing weapons, accessories, or your figure repair parts! Big Bad Toy Store’s latest newsletter shows off some great upcoming products, including Masterpiece Bluestreak, Combiner Wars Leader Ultra Magnus, and Avengers: Age of Ultron Hot Toys! Check the latest newsletter below. 20% off Sale at Marauder “Gun-Runners” Spring-Fever! Tired of winter? Sick of snow? We are too! To get us all in the mood for spring…here is our FIRST ever “Spring Fever” sale on the website! 20% off ALL orders of $14.99 or more. ALL items on the site are eligible and the discount is automatically applied to the order! Event is scheduled to end Sunday night the 22nd…but we reserve the right to end the promo sooner for any reason. So now is a great time to get all your 1:18 scale miniature “gun-running” needs filled! 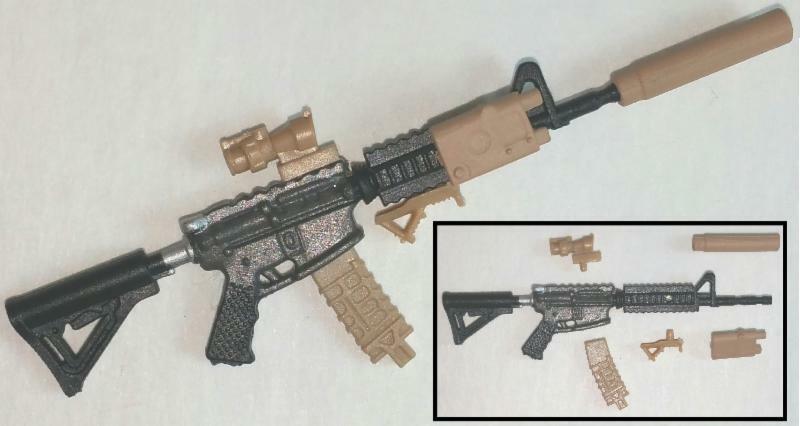 Also, please check out our new “geared-up” weapons, such as the gun-metal color M4 MOE rifle available with either black or tan modular accessories for just $2.99 each ($2.39 each if purchased on a qualifying order)! Hope you all stop by and check out the event! Thanks again for your support and Hooray for Spring! Site sponsor Big Bad Toy Store has sent out their latest newsletter… click the Continue Reading link below to see the details. I will fully admit I don’t really understand the appeal of these, but I know there are folks out there who are into them, so more power to you. Snake Eyes has been posted to BBTS with a price tag of $107.99, which is actually a price break over the original $119. A neat conversation piece to be sure. Order G.I. Joe Battle Below Zero Vehicle Set, Not Mint from Entertainment Earth! Big Bad Toy Store has released their latest customer newsletter. Click the Continue Reading link below to check it out. Entertainment Earth Sponsor News – New Batman Exclusive, Avengers Age of Ultron, and Sailor Moon! Here’s the latest sponsorship news from Entertainment Earth, launching a wealth of pre-orders and in stock specials!